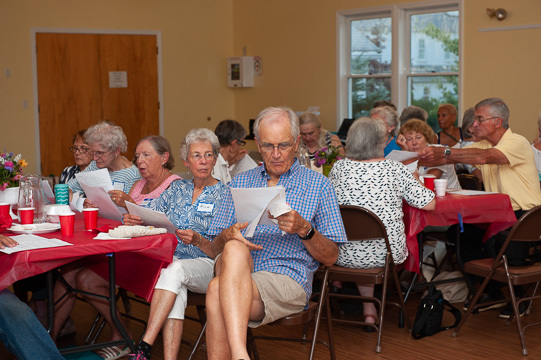 Our annual meeting was held at the First Congregational Church's hall. Dinner was a buffet provided by Gourmet Gardens, Falmouth, MA. At the gathering we review our finances, the past year's activities, recognize member contributions and achievements and EAT. Members are in almost universal agreement that the most important parts of the evening are the recognition, the chance to socialize, and the food. Tonight we honored 5 members with their white pin. 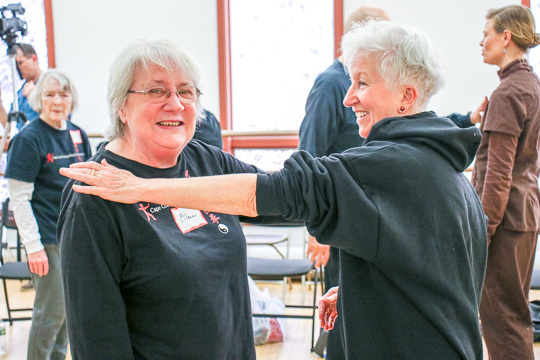 Known as Finishers, they have received instruction in the 64 movements of the taiji set and are identified by their primary teacher as having the ability to complete the set. They are now on a lifelong path of continuous learning. 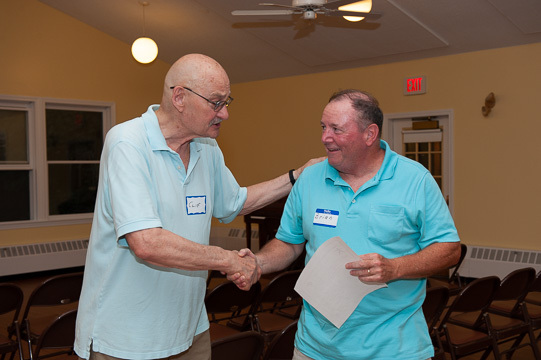 Member Brian Connolly receiving his completion certificate. Our newest white pin members! 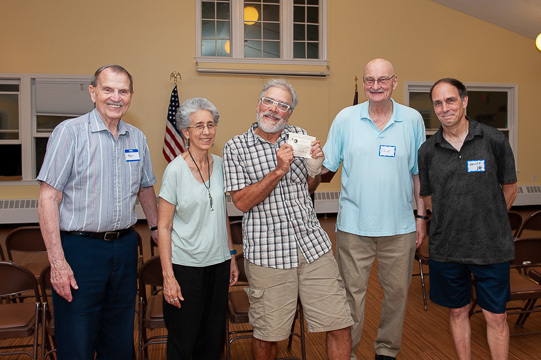 Clif Genge presented the awards to Louise Theroux, Bill White, Lynn White, Brian Connolly and Florence Ramsey. Black Pin Recipient Al Moniz. This is the highest Club recognition and takes a minimum of eight years of active club membership for the individual to achieve. Giving the award are teachers Paul Andrews, Jen Kano, President Clif Genge and Geoff Way. 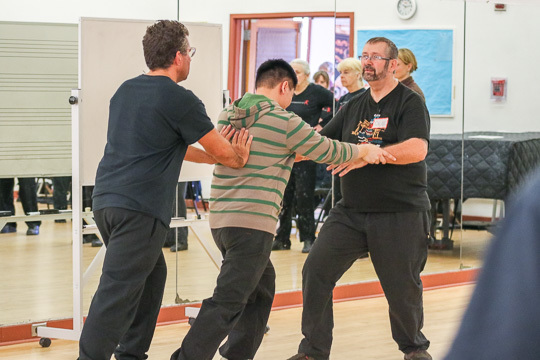 Our Club had the privilege of receiving push hands training from Sifu Dug Corpolong0. He explained the principles in a relaxing, easy to understand manner that made everyone feel comfortable and encouraged their participation in the workshop. 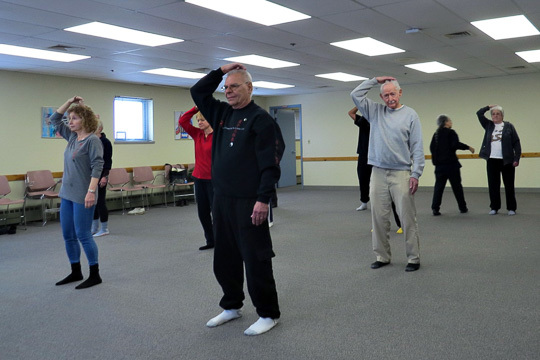 He covered some of the basics of Tai Chi which are the foundation for improving balance, preventing falls, and helping seniors increase confidence in day to day situations. Dug has a tremendous amount of experience and a wealth of information that he shares in such a personable manner as he involves everyone in the class. They all felt they had received an approach to Tai Chi principles that could be used in their personal practice. At the end of the day, everyone was excited and ready to start using the new information. 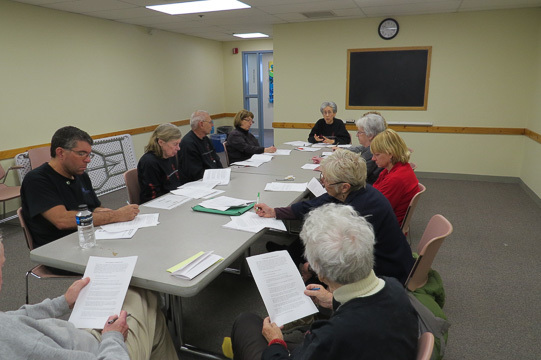 On a snowy Tuesday, January, 30, 2018, Jennifer Kano taught a Teaching Tips Workshop to 12 Cape Cod Guang Ping Tai J Quan Club members. 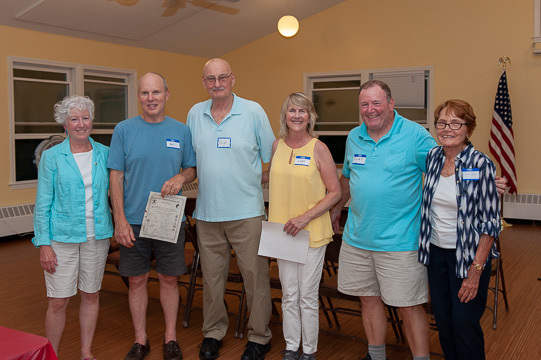 Members of the club volunteer to serve the organization in all functions and this group volunteered to be teaching assistants at our training and practice locations. Jen has been one of our five volunteer teachers for over 20 year and offers this course to more experienced members who would like to assist the teachers. The TT Workshop consists of 3 levels of instruction which cover a multitude of subjects from “understanding the benefits of teaching to the teacher and helping a student practice a skill they have been taught by the primary teacher to teaching a new move and how to run a class when substituting for the primary teacher.” This workshop is a component of our club recognition system and covered the subjects taught in the first and second level. 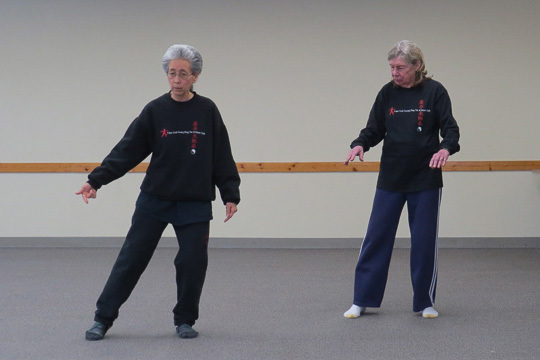 Since 1995 the Cape Cod Guang Ping Tai J Quan Club has been offering tai chi training and practice classes to anyone who is interested in learning the Guang Ping Yang style. It is an all-volunteer non-profit organization.